For multiinput models, independent step commands are applied to each input channel. The time range and number of points are chosen automatically. 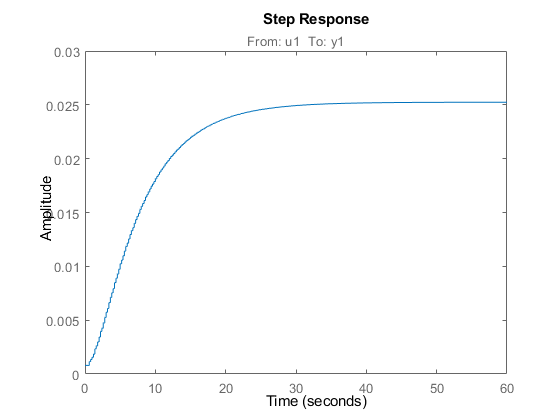 stepplot(sys,Tfinal) simulates the step response from t = 0 to the final time t = Tfinal. Express Tfinal in the system time units, specified in the TimeUnit property of sys. For discrete-time systems with unspecified sample time (Ts = -1), stepplot interprets Tfinal as the number of sampling intervals to simulate. 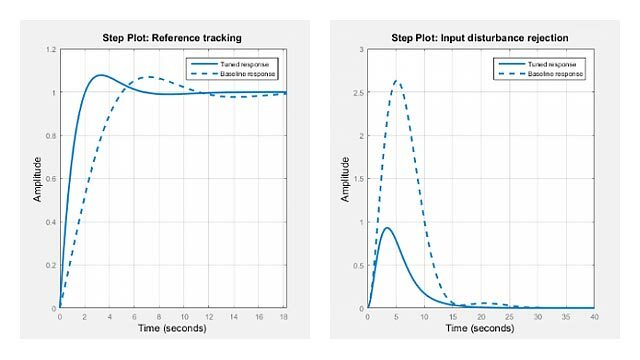 stepplot(sys,t) uses the user-supplied time vector t for simulation. Express t in the system time units, specified in the TimeUnit property of sys. For discrete-time models, t should be of the form Ti:Ts:Tf, where Ts is the sample time. For continuous-time models, t should be of the form Ti:dt:Tf, where dt becomes the sample time of a discrete approximation to the continuous system (see step). The stepplot command always applies the step input at t=0, regardless of Ti. stepplot(AX,...) plots into the axes with handle AX. stepplot(..., plotoptions) customizes the plot appearance using the options set, plotoptions. Use timeOptions to create the options set. stepplot(..., dataoptions) specifies options such as the step amplitude and input offset using the options set, dataoptions. Use stepDataOptions to create the options set. 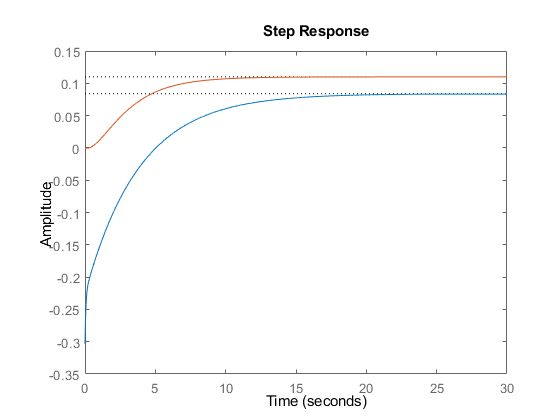 Generate a step response plot for two dynamic systems. Each step response settles at a different steady-state value. Use the plot handle to normalize the plotted response. Now, the responses settle at the same value expressed in arbitrary units. Identify a parametric and a nonparametric model from sample data. 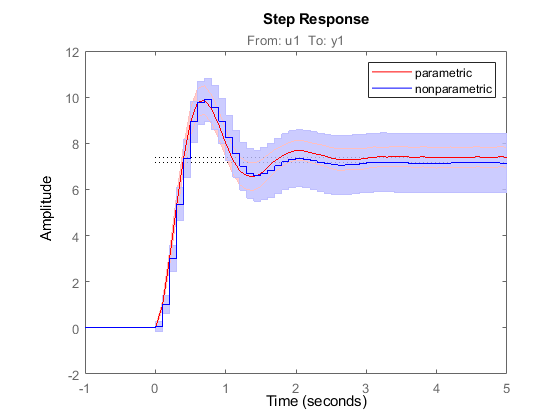 Plot the step responses of both identified models. Use the plot handle to display the 3-σ confidence regions. The nonparametric model sys2 shows higher uncertainty. Load data for estimating a nonlinear Hammerstein-Wiener model. z is an iddata object that stores the input-output estimation data. Estimate a Hammerstein-Wiener Model of order [1 5 3] using the estimation data. Specify the input nonlinearity as piecewise linear and output nonlinearity as one-dimensional polynomial. Create an option set to specify input offset and step amplitude level. 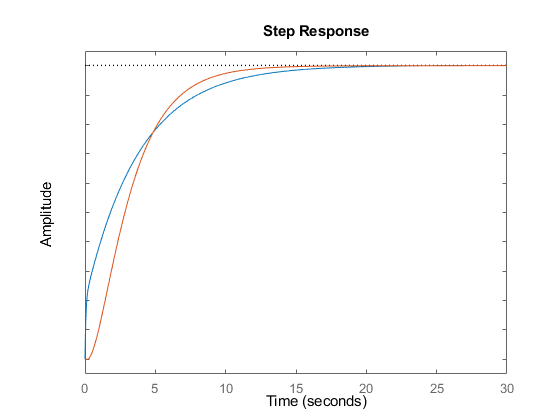 Plot the step response until 60 seconds using the specified options.